The Swift Conqueror was, for many years, Swift’s luxury range-topper. These days it is sandwiched between the top-of-the-range Elegance, and the more affordable Challenger – a range that includes twin-axles. The Conqueror 645 may appear ostensibly similar to the Challenger SE equivalent, but encountering one first hand soon quells any doubts that it is worth the extra £1940. The 645 is one of just three Conquerors on offer in the Swift Group's 2015 caravan ranges (and the only twin-axle). The question is: does it fall between two stools? Externally, the Conqueror and its cheaper sibling are similar. A slightly different front panel and window profile, together with lower-set grabhandles, gives the game away. Even the glossy white flanks and tasteful graphics look broadly the same. Out back, though, the frowning lights of the Challenger are replaced on the Conqueror by more stylish car-spec LEDs. The alloy wheels are broadly the same, but the Conqueror boasts Al-Ko Secure wheel locks as standard – so much easier to fit than a wheelclamp. All steadies are easy to reach, and all the major service points are on the offside wall, away from the awning. As well as the gas barbecue point, there’s an external shower point and a mains socket for powering TVs and stereos within the awning. The 645 also has a dual-role water filling system that includes a 30-litre onboard fresh tank. This allows you to draw water from an external container, and provides added internal capacity. Swift has fitted a large panoramic sunroof above the window-line and an opening Heki 2 rooflight slightly further back. Factor in the four reading lights, ambient strips along the top of the roof lockers and a central ceiling unit containing five bulbs (and the stereo speakers), and there’s no way this lounge is going to feel dark and dingy. The overall ambience is very pleasant, too, with fashionably neutral biscuit-coloured soft furnishings and a high-gloss finish to the cabinetry. Less impressive, although useful, since it contains a couple of power points, is the plastic unit on top of the centre chest. There is no factory-fitted mounting point for a TV in here. The split-level dresser by the door is the obvious place to put one (the 230v/12v sockets and aerial points are the giveaway), but you’ll have to stow it away every time you hit the road. Worktop space is reasonable, but is made more generous once you’ve deployed the large extension flap. The whole area is well-lit thanks to a downlighter, twin pin lights in the ceiling and an illuminated splashback. The hidden strip light above the cutlery drawer is arguably less useful, but looks the part. Kit levels are good. The 190-litre fridge/freezer sits opposite the main galley and incorporates a separate 35-litre freezer box. The new-for-2015 Thetford Aspire 2 cooker has a dual-fuel hob and separate oven and grill, plus there’s a microwave oven. The Conqueror 645's washroom boasts ample dressing space and plentiful storage, including a pair of large open shelves, two more by the basin and two separate cupboards. A domestic-style heated towel rail, a backlit mirror and a pair of speakers offer elements of luxury. The separate shower cubicle is fitted with a bi-fold door, a dedicated light and a towel airer. The Conqueror 645 is billed as a four-berth, but we suspect it will be bought by couples, and it really shines when used as such. The transverse island bed in day mode facilitates easy access to the end washroom and is big enough for daytime snoozes, but pulling the bed base out and dropping in an infill cushion near the headboard creates a rear double island bed that measures 1.85m x 1.33m (6’1” x 4’4”). The mirrored vanity unit, with dedicated pin light, is a second TV spot (again it lacks a permanent fixing), with mains, 12V and aerial points. Up front, the parallel settees make up easily into a double 2.07m x 1.56m (6’9” x 5’1”), but aren’t quite long enough to serve as adult single beds, being 1.56m x 0.72m (5'1" x 2'4") . They’re fine for kids, though, and are long enough for putting your feet up. Raising the sofa bases reveals one void occupied by the fresh water tank, but the other is almost clutter-free. The power supply unit is located in the offside front roof locker. The kitchen’s various doors open to reveal all manner of stowage, including slide-out metal baskets and two jumbo-sized cutlery drawers. The bedroom’s twin wardrobes are a good size (with one bolstered by three low-level drawers) and the bed base lifts to reveal a huge void. The case for buying a Swift Conqueror 645 over the equivalent Challenger SE seems – on paper – a bit wobbly, but closer scrutiny reveals that the Conqueror has enough to justify its price premium. 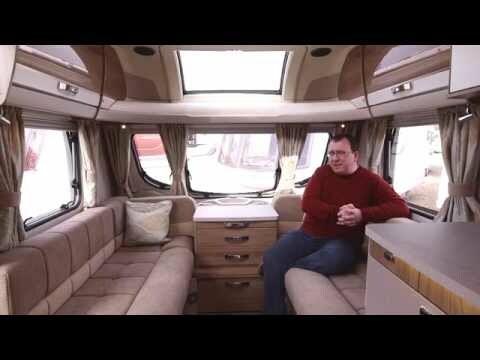 Looking at Swift's 2015 caravan ranges, if an Elegance is out of your league and the Challenger SE isn’t quite special enough, the Conqueror is a fine choice.